My first encounters with Spanish food were less than satisfactory. This was partly my fault for visiting places like Torremolinos, Benidorm and Arenal in the first place, partly the fault of the average British holidaymaker who mistrusted food produced anywhere south of the English Channel and partly the fault of the hotel chefs who, in order to appease the insular Brits, attempted to cook English-style food but were not very good at it. Like most British holidaymakers who spent their two-week holiday in Spain in the 60's and 70's, I saved some of my hard-earned cash in order to spend it on a package holiday that included full board. After a few hours on the beach, I would make my way back to the hotel for a less than adequate lunch. Some days, I would obtain a packed lunch in lieu of the midday meal but this was mostly uninspiring - some unidentifiable meat or processed cheese sandwiched between slices of dry bread accompanied by a hard unripe peach. Even breakfast was abysmal - a couple of hard rolls with a modicum of butter and very sweet jam. In short, we Brits did not visit Spain, in those days, for its cuisine! Today, some British holidaymakers are more adventurous and part of their holiday experience is sampling the local food whether they are in Barcelona, Bilbao or Bangkok. If, like me, you love Spain you will not be disappointed with the food. It is not all paella or calamares and chips, though I have to admit a fondness for both. 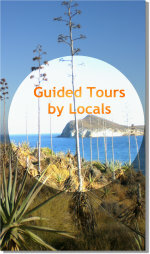 There is tremendous variety and plenty of opportunities to enjoy a gastronomic experience. However, do not expect eating customs to be the same as in the UK. The Spanish do things differently to us Brits! Their hours are different - they take a nap in the afternoon, often dine in a restaurant after midnight and eat breakfast mid-morning. I have been patiently waiting in a queue in a bank or the doctor's surgery and the receptionist has suddenly left, leaving a notice - "gone to breakfast - back in 20 minutes"! Usually, the 20 minutes turns out to be half-an-hour. There are many places to eat, from bars to gourmet restaurants. Living in Andalucía as I do, I am invariably offered a tapa whenever I buy a beer or a glass of wine and I have noticed that this excellent practice has spread to other regions. In most places a menú del día is offered which is usually tremendous value and typically offering a choice of first and second courses plus salad, bread, a drink and pudding for around 9? - about £8! Restaurants also offer platos combinados - the Spanish equivalent of meat and two veg, as well as raciones which is a plate of one particular food. It is customary for a group of people to share two or three of these plates of food between them. On special occasions, my wife and I visit a posh restaurant and choose 'a la carte'. My favourite dining experience, however, is to drive up to the little mountain village of Enix. In a restaurant there, I order 'conejo con ajo' - garlic rabbit - for my main course. I also order a dish of ajo blanco in which to dip the doorsteps of crusty bread. It only costs a few euros for this scrummy dish made from almonds and garlic but it is enough for four or five people to pass a pleasant interlude whilst waiting for their main course, especially when washed down with glasses of country wine! It is peasant food but delightful! This sort of experience can be had all over Spain - unless you are the type of Brit who visits the Costas to gorge yourself on 'Full English' breakfast and British beer! Every town and tiny village prides itself on its local gastronomy. There are regional differences in the cuisine offered but also local differences. The speciality of Ugíjar, a town in the Alpujarras, is 'cabrito en ajo cabañil' - kid in garlic. A few miles away, in the village of Válor, their main speciality is 'puchero a la gitanilla' - a gipsy style stew. With even tiny villages providing their own specialities, I could not begin to compile a comprehensive list of Spanish food. Instead, I will just mention some of the dishes on offer. Paella is, of course, one of the characteristic dishes of Spain. It is a rice dish and is usually garnished with vegetables and meat or seafood. The three main ingredients are rice, saffron, and olive oil. Paella is a speciality of Valencia where it is traditionally eaten on Sundays. However, these days, it is on menus in restaurants all over Spain. The name paella is Catalan for "frying pan". In the Asturias, a favourite dish is fabada Asturiana. It is often simply known as fabada and is a rich bean stew. Again, it is available throughout Spain. It is made with dried white beans which are soaked overnight before use. Pig products are also added - chorizo, morcilla and shoulder of pork. 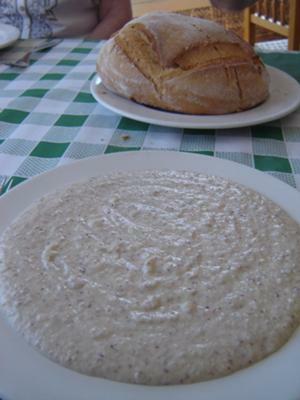 It is a heavy dish that is mostly eaten at lunch with bread and Asturian cider. Merluza a la sidra is another Asturian dish - hake cooked in cider. When I was first offered gazpacho, I was a bit apprehensive. "Cold soup!" "Whatever next!" However, it is delicious. My Spanish friend, Jaime, often makes gallons of the stuff and gives me some. He uses the best fresh tomatoes, cucumber, peppers, olive oil and plenty of garlic. It can be eaten as a soup, possibly garnished with pieces of jamón, with crusty bread or drunk from a mug as a refreshing drink. A relative of gazpacho is the aforementioned ajo blanco. It is another cold soup and is often the same sort of consistency as gazpacho. However, I prefer the 'porridge-like consistency' served up in Café Bar Almería in Enix. Ajo blanco is made from garlic, almonds, olive oil and bread. In Málaga province it is served with grapes. Jamón is probably Spain's greatest contribution to gastronomy - not any old ham, mind you, but quality cured hams! Some 40 million hams are cured annually with the average Spaniard eating over 10 pounds of the stuff every year - that's pounds weight because jamón can be quite pricey, especially the very best Jamón Iberico de Bellota. There is a vast range of jamón available in Spanish shops and the difference in quality is identified by a number of factors including the type of pig, what they eat and the time of curing. Ninety percent of the jamón available is ordinary cured ham and comes from white pigs. Phrases like jamón serrano, jamón curado, jamón reserva and jamón extra serve to identify these lesser varieties of cured ham. Having said that, these types of jamón can still be delicious. Jamón Ibérico, is ham from the Iberian pig - also called Pata Negra. However, these particular pigs are not really black - they are grey coloured! Come to that, why do people call non-red wines white? They are mostly yellow! But I digress. The very best jamón comes from Iberian pigs that feed on a diet of acorns - especially those lucky swine snuffling under the oak trees of Extremadura. The word ' bellota ' is used to identify this variety, which produces some of the best 'Jamón Iberico de Bellota' in Spain. Spanish sausages are delicious. There are those that are similar to English and German bangers but I particularly like the red and black varieties - namely chorizo and morcilla. Chorizo is spicy; pork based and is a popular tapa. Morcilla is the Spanish equivalent of black pudding. 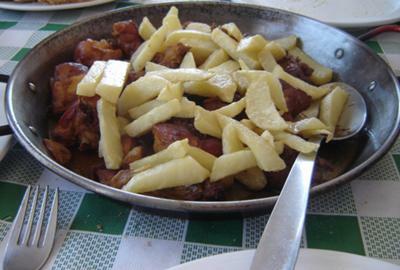 Both can come in the higher quality Iberico variety and both are constituents of plato alpujarreño - the Spanish equivalent of sausage, bacon, egg and chips, although pobres patatas are usually substituted for the patatas fritas. Another Spanish favourite is Tortilla de patatas - a sort of omelette made with - um - eggs and potato. 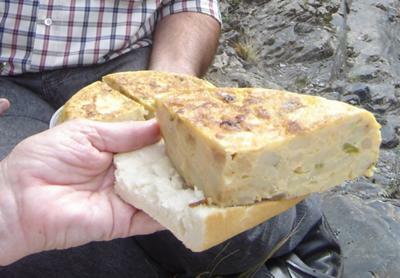 It is sometimes called tortilla española to distinguish it from the tortilla francesa (French omelette). Many of the dishes mentioned so far can be found in restaurants all over Spain but there are regional differences, which are often determined by environment and climate - like thick stews in cold mountain areas and lots of fish in coastal regions. The specialities of Andalucía include pescaito frito - fried fish as well as the aforementioned gazpacho, ajo blanco and, in the Alpujarras, plato alpujarreño. Seafood is popular in Galicia and the Basque Country. Bacalao al pil pil - fried cod in hot garlic sauce - is a favourite with the Basques whilst in Galicia they favour pulpo - octopus. Caldo gallego, a hearty vegetable soup, is another favourite of the people of Galicia. La Mancha is famed for its game dishes like rabbit stew and, of course, queso manchego. In Murcia, salted fish is popular whilst Extremadura is noted for its sausages but then it does have lots of pigs! And so it goes on - every region, town and village has its own specialities of delicious food which, of course, can be accompanied by the local beverage - Sherry in Jerez, Cava and Penedés in Catalonia, Rioja in La Rioja, Cider in the Asturias, Valdepeñas in La Mancha. Of course, the drinks mentioned above are available throughout Spain and the rest of the World - just like the best of the food!